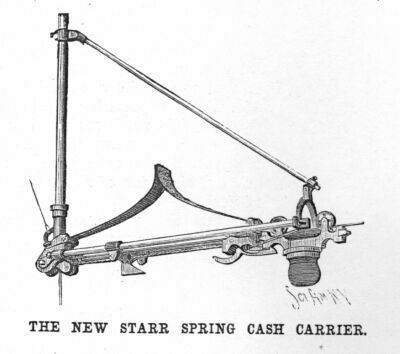 The Day (New London, CT) , 6 May 1887, recorded that "Joseph Starr, of Henfield & Starr, has received letters about his recently patented cash carrier from widely separated portions of the United States and Canada. The carrier is simple in construction, practical in operation and will not be near so costly as others now in use." The news did not take long to reach the Southern hemisphere. The above illustration is from the Australian Town and Country Journal, 8 Oct. 1887, p. 30. "Fig. 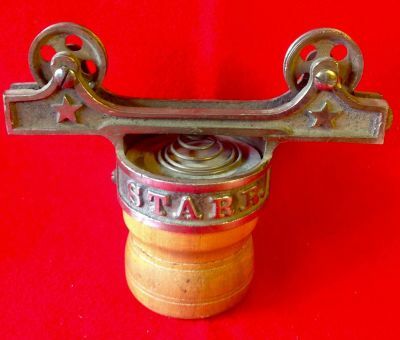 1 represents Starr's IMPROVED CASH CARRIER, which is simple in construction, practical in operation, and requires no extra motion to disconnect it from the stop blocks; while, the car, owing to suitable buffers, can receive no injury from coming in contact with the stop blocks. To the upper surface of the car are secured uprights, in whioh are journaled the axles of grooved wheels running upon the overhead wire or track. In other uprights is held a rod on which are placed two coiled springs so arranged that the rod acts as a double buffer to the carrier; each of its ends being adapted to strike a stop block, two of which are attached to the wire, one at each end. Near each end of the bar is a pawl, acted upon by a spring which lifts its free end so that it will automatically engage with a lip formed on the stop block for holding the car stationary when it reaches either end of its trip. The pawls are disconnected and the car started by means of levers pivoted to the frame and connected with the pawls. When either of the levers is grasped for shoving the car along upon the wire a slight downward pressure upon it will free the pawl from the lip, thus freeing the car, which, by a slight forward movement of the hand, may be caused to travel the wire to its opposite destination. The money is carried in a cup attached by bayonet connections to a rim secured to the under surface of the frame. 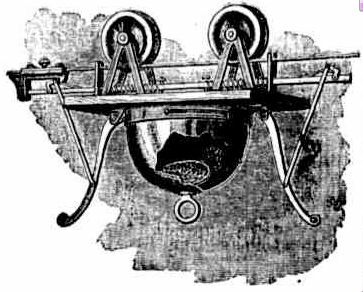 This invention was recently patented by Mr.Joseph Starr, of New London, Conn., U.S.A."
The second illustration is from Scientific American, 16 April 1892, p.243: "a new device for the conveyance of cash .. recently patented by Mr Joseph Starr, of New London, Ct. In the design of this machine, all superfluous attachments have been omitted, and it is reduced to the practical and useful... The car is propelled along the wire by the use of a steel bow spring, which, as will be readily understood, is superior to rubber bands and cord combinations." However, this superiority did not seem to result in its success over its Lamson rivals. There is a court case of 1892 between Jospeh Starr and a purchaser (whose earlier system from another manufacturer was removed) and another case between Joseph Starr and the company over ownership of a patent. One store known to have had a Starr system is Beckwith & Keefe of New London, Conn. which opened on 22 October, 1889. The only photograph I have seen of a Starr carrier is this one, kindly supplied by Bill Deacon Jr. Apart from the stars and the spring at the top, it is remarkably similar to a Lamson car.